8,700 one-way indirect passengers, 53% business - figures from Swedavia's passenger survey, full year Q3/16-Q2/17- unstimulated current travel volumes. 11,200 one-way indirect passengers, 51% business - figures from Swedavia's passenger survey, full year Q3/16-Q2/17- unstimulated current travel volumes. 12,800 one-way indirect passengers - figures from Swedavia's passenger survey, full year Q3/16-Q2/17- unstimulated current travel volumes. 44,000 indirect passengers - figures from Swedavia's passenger survey, full year Q3/16-Q2/17- unstimulated current travel volumes. 16,050 one-way indirect passengers, 47% business - figures from Swedavia's passenger survey, full year Q3/16-Q2/17- unstimulated current travel volumes. 16,800 one-way indirect passengers, 49% business - figures from Swedavia's passenger survey, full year Q3/16-Q2/17- unstimulated current travel volumes. 24,930 one-way indirect passengers - figures from Swedavia's passenger survey, full year Q3/16-Q2/17- unstimulated current travel volumes. 19,600 indirect passengers - figures from Swedavia's passenger survey, full year Q3/16-Q2/17- unstimulated current travel volumes. 18,900 one-way indirect passengers - figures from Swedavia's passenger survey, full year Q3/16-Q2/17- unstimulated current travel volumes. 16,800 one-way indirect passengers, 58% business - figures from Swedavia's passenger survey, full year Q3/16-Q2/17- unstimulated current travel volumes. 42,800 indirect passengers - figures from Swedavia's passenger survey, full year Q3/16-Q2/17- unstimulated current travel volumes. Large and growing catchment area with 3 million inhabitants within 2 hours drive. Large business hub with many international trade relations. Biggest clusters are automotive (home of Volvo), life science and ICT. Geely recently announced it will locate new European R&D centre in Gothenburg. Popular tourist destination, incoming tourism has increased massively during the past few years. Gothenburg has recently been voted the most sociable (welcoming) city in the world. International community with 20% of the population having foreign background, excellent base for VFR travel. Two large international universities with more than 50,000 students. One of Europe’s largest, ongoing city development projects, creating jobs and growth in the region. Support from local partners in the Gothenburg Region such as Business Region Göteborg, Tourism authority Göteborg & Co, Visit Sweden. 60-minute catchment (by road): 1.5 million people. 120-minute catchment (by road): 3.0 million people. Express/package operators account for the main, regular freight traffic. Capacity for large freighters. Gothenburg Landvetter frequently handles large ad-hoc freighters to serve demand for fast and reliable transportation. Gothenburg Landvetter connects directly to the R40 motorway. It is a 20 minutes drive to central Gothenburg to the West, and the city of Borås to the East. Runways: One – direction – 03/21; length – 10,823 feet. One main terminal: Combined Schengen and domestic. Non-Schengen area is directly connected. The airport is currently undergoing a development/expansion program, which will include three new air bridge gates (terminal expansion to the south). New, common use security control. 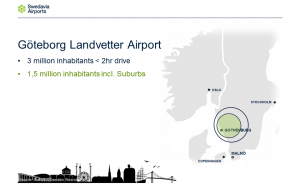 In 2017, approximately 6.8 million passengers are expected to travel to/from Landvetter Airport. Strong traffic growth so far in 2017. For the period Jan-Aug 2017 the total number of passengers has increased by 7% year-on-year. Scheduled international traffic contributed most to the passenger increase. More than 10 new international routes have opened/will open in 2017. 30% of traffic made-up of foreign passengers. One-third of passengers travel for business. 61,176 tons handled in 2016. 12% year-on-year increase experienced for the period from January to June 2017. Largest freight carrier: DHL Express.